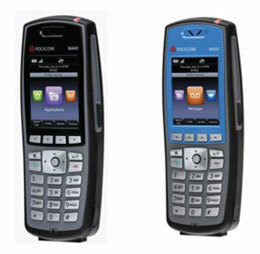 Spectralink 84-Series Wireless Handsets improve productivity and responsiveness for on-site mobile professionals. Ideal across a wide range of industries, including healthcare, retail, manufacturing and hospitality. Built on open standards, the Spectralink 84-Series Handsets transforms the delivery of mobile enterprise applications by bringing the power of thin client and browser technology to front-line professionals in an easy-to-use and easy-to-manage interface. Additionally, the Spectralink 84-Series supports the industry’s broadest range of interfaces to enterprise-grade PBX, wireless LAN, and infrastructures to deliver maximum interoperability with the lowest overall cost of ownership in the industry. Maximize staff efficiency by leveraging on-board web-based applications through the industry’s only enterprise VoWLAN device with integrated WebKit-based web browser, bar code imager and XML-based API. Handset Comparison Contact us today!